Live For Food » Blog Archive » Chicken: what can you do with it? Chicken is probably one of the cheapest meats you can buy today, depending on what cut you get. So I thought I would do a little summary of the various cuts you can buy and what you can do with them. Chicken is commonly bought as a whole bird. Your standard bird feeds anywhere from 3-6 people and is usually prepared by roasting in the oven. If you buy the plastic wrapped type from the supermarket the cooking instructions will tell you how long to cook it for, otherwise use 20 minutes per pound plus 20 minutes at 200C. Whilst they can be basted, stuffed, or have stuff inserted under the skin, you will get a perfectly acceptable result just bunging it in the oven. 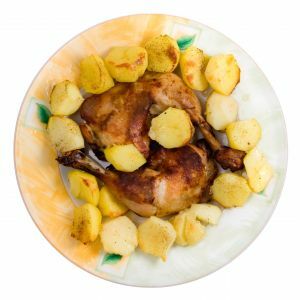 If you want something slightly fancier try out this classic roast chicken recipe from BBC Good Food. You can also roast chickens in the slow cooker, although I’ve never got round to trying it myself. Leftover roast chicken goes well in curries and pies and sandwiches. And also as a treat for the cat who will never leave me alone when I’m stripping a carcass. You can also make stock using the carcass but I’m afraid this is something I can’t be bothered with. A chicken leg consists of both the drumstick and the thigh portions. These also roast well on their own especially if sprinkled with a bit of salt and garlic. 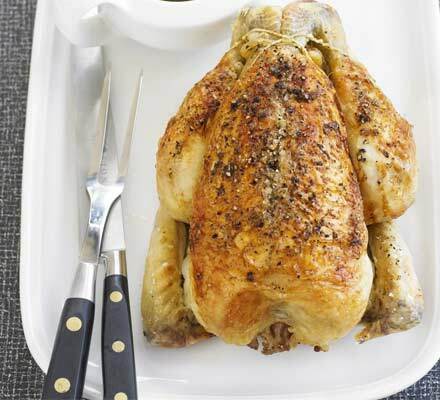 Its an economical way of making a roast chicken dinner without having to buy the whole bird. You also get recipes for oven bake type things and even casseroles for chicken legs however the legs can be quite fatty so if they are submerged in liquid to cook the resulting dish can have a fatty sauce or film on top which is not that great. 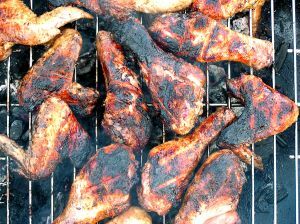 Drumsticks and wings can also be roasted in the oven but unless they’ve got a decent marinade on they tend to dry out. The following two marinades are nice. The quantities are for 8 drumsticks. Or you can buy them ready marinated or even ready cooked. Once you’ve cooked them in the oven they can be finished off on the barbecue for 5 minutes for a smoky taste. Great either hot or cold with a nice salad. Chicken thighs are best in casseroles and stews in my opinion, although they can be roasted or marinated and barbecued in a similar way to drumsticks. 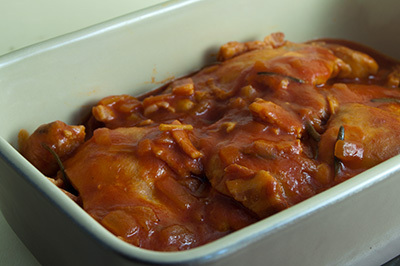 Have a look at my recipe for chicken and bacon cacciatore. The meat is tasty and soft, and best cooked for at least half an hour say in a stew to an hour and a half in a casserole. I always take the skin off, and sometimes take the bone out too which can be a bit fiddly and messy, but its worth it. You can also buy thigh fillets which are ready skinned and deboned. If you’re on a budget thighs are the cheapest cut to buy and probably give the most variety in terms of different casseroles you can do. For an easy option you can buy packet casserole mixes which just involve putting the chicken thighs, some vegetables, the packet mix and some water in a dish and sticking it in the oven. Many people think the darker meat is tastier and more tender than the more expensive breast meat anyway. Chicken breasts are the most expensive cut of chicken. You may find you can buy frozen packs which are much cheaper but the quality if the meat may suffer. Cheap chicken breasts often have a high water content and taste kind of spongy. They come in all different sizes – a small breast will serve one person, a large one can go between two. 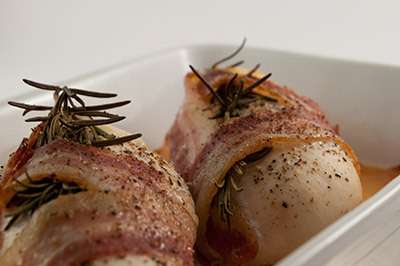 Because the breast meat is naturally tender its suitable for quick cook meals such as stirfrys, fajitas and pasta dishes. They are also suitable for stews and curries cooked in the hob, whether homemade or using sauces from jars. They can be roasted in the oven but have a tendency to go dry so I would suggest either cooking them in a shallow layer of gravy with a sprinkling of seasoning of some kind on top, or cooking them wrapped up in foil parcels. They are also nice stuffed with cheese and wrapped in bacon. You should try getting a free range chicken. Way tastier and better for you. I had one and I could never eat regular chicken again after.